If you ask any new triathlete what they’re most afraid of at their first triathlon, 9 out of 10 times they are going to refer to the swim. It’s usually the sport that stops a lot of people from doing their first triathlon. Like the novice, veteran triathletes also experience challenges in open water, such as swimming in a straight line, since there are no lines to refer to at the bottom of a lake. You also have to deal the “washing machine” that is a triathlete swim start, potential waves and cold temperatures. So with all these challenges you may face in open water, how can you properly prepare in the pool? While swimming in open water as practice would be ideal, for many that’s just not possible. However, there are some easy tactics you can use in the to help you prepare for the unique challenges of an open water swim. 1. Swim with a group – preferably a large one. Join a master’s team, practice with a club, or just go to the pool during the busy lunch hour and swim circles when the pool is crowded. If you’ve never been to a triathlon, just look up “triathlon swim start” and watch the videos. The first 200 yards or so are really tough. Everyone is kicking, splashing and contributing to the general melee that is known as the “washing machine”. It doesn’t matter how calm the lake or ocean is, these first 200 yards are what people dread, and what makes a lot of athletes give up on their first race. Being able to practice in a pool with a lot of people that may rub up on you, or are generally just making waves, will help you overcome that anxiety. Don’t have a crowded pool? Get a few friends to jump in and swim in the same lane with you, or have them splash around on you with kickboards. Really, it helps. 2. Go Hypoxic. Hold your breathing. Hold your breaths for longer than you normally do. If you normally breathe on every stroke, try breathing on every three, five or seven strokes. Also practice longer sets by swimming the first 25 yards with barely any breathing, then going hypoxic for the next 50-75 yards, before settling into your normal breathing for the rest of the set. If you refer back to the washing machine I was talking about, the first 200 yards of the race are typically all-out sprints, with people fighting to get into position. With all the splashing going on, it’s hard to get in a good breath, so it’s good to practice being uncomfortable with your breathing. This way, when race day comes you don’t get anxious in the water. Pick a spot, or better yet several spots, on the opposite wall from where you are swimming. Pretend these spots are buoys in the water. In my pool, there’s a clock right above the lanes, so I focus on that. As you swim the length of the pool, practice looking up at the object while you continue to swim forward. Practice doing this every few strokes during some of your sets. Now that you’ve got out of the swim start and are settling into your groove, you need to be able to swim straight! You can easily swim hundreds of extra yards on the swim course if you don’t go in a straight line, so practice your sighting. If you’ve ever seen water polo, you’ll see a lot of swimmers swim this way as they look up to find the ball. 4. Breathe on both sides. If you normally breathe on your left side, start practicing on your right. Or better yet, alternate which side you breathe on as you go down the pool. There are a few reasons here. Sometimes buoys are lined up in a straight line, so being able to swim and breathe to one side ensures you always have a buoy in sight without having to sight too often. There’s also the chance you may have a clingy swimmer sticking to one of your sides, so you want to breathe on the other side to avoid swallowing any water the other swimmer is splashing. And lastly, you also never know which side the waves are coming from. Say you only breathe on your left, but that is where the waves are coming from. If you can’t breathe to the right, you’re going to take in a lot of water on every breath. If you can breathe to the right, your head will break the wave a bit so you can get a breath of air without taking in water. Incorporate form drills in your warm up and cool down. There are many resources out there to learn proper form. Or, work with a reputable coach. Open water swimming is tough and can be exhausting. Not only are you trying to swim your own race, you are battling weather conditions like choppy waves, and conditions caused by other athletes. 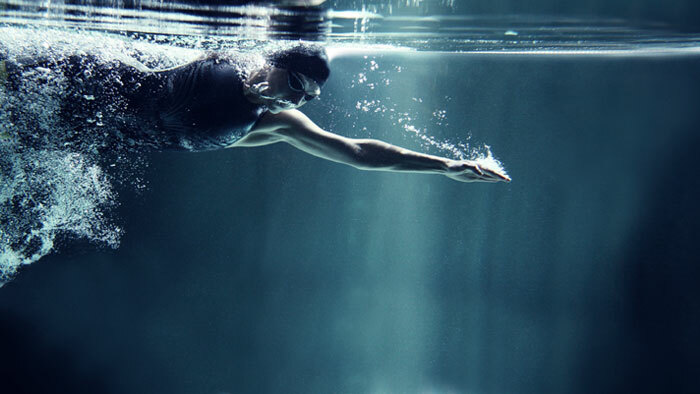 By having your form dialed, and being as efficient as possible in the water, you’ll be able to expend less energy during the swim than if you were just battling the water the entire time. Race day bonus tip: Bring extra goggles & take a cold shower! Bring extra goggles and leave them in your transition bag. The last thing you want during your warm up on race day is to have your goggles break, and to be stuck swimming without a set! On race morning, take a cold shower. If it’s easier, start off with warm water, and slowly decrease the temperature making it colder and colder until it’s something you can barely tolerate. Stay there for a couple of minutes before getting out. Most people make the mistake of waking up from their warm hotel room bed, drinking warm coffee and putting on warm clothes before heading down to the swim start, where the lake or ocean is extremely cold. Then, they panic when they feel the water. It’s best to get used to this uncomfortable feeling in your shower. There you have it! Practice these tips in the next few weeks as race season approaches, and you’ll be prepared and confident for your next open water swim! Tony Zamora is a lifelong triathlete having started his racing career in High School. Now, founder and head endurance coach for TZCoaching, an endurance sports coaching service working with athletes around the globe with online training programs; Tony also leads group swim, bike and run classes in the Chicagoland area. Follow Tony on twitter @tzcoaching and on his blog at www.tzcoaching.com.